Also known as: Koro-Sensei Quest! Apparently there's a film. Wacky. It's not a compilation, but a standalone 2016 film to which this TV series is a sequel. I might hunt it down, but to be honest this is a dispensable gag series that's not even as funny as the original. Assassination Classroom was a big hit, so spin-offs like this got more likely to be greenlit (as with Attack on Titan: Junior High). 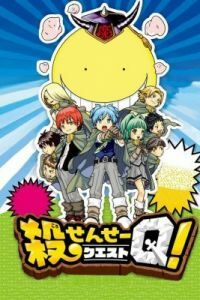 It's Assassination Classroom in a fantasy RPG setting. Koro-sensei is the Demon King, while his students are training to be heroes and wizards. They go dungeon-bashing, fight monsters and collect treasure. It's okay. I quite enjoyed it. I'd watch a second series, if they made it. However it's not taking its premise seriously and I think it's weaker than the original in every respect. It's not dramatic. The cast are basically there for gags. It's less funny, since its jokes are mostly just silly instead of being rooted in a dramatic situation. Koro-sensei's students are still ostensibly trying to kill him, but this doesn't crop up much and you could be forgiven for forgetting about it. They assume you know the original. Most of these episodes are condensed gag versions of the original's storylines, so it's full of spoilers and could perhaps have done with introducing more new material. Don't watch this first. That said, though, I didn't mind the show and I watched it all happily enough. I love Assassination Classroom, even watered down like this. Natsuki adores Koro-sensei, by the way. That big yellow octopus makes him laugh and I think he'd watch absolutely anything Koro-sensei related, even if it's just over my shoulder while he's eating breakfast and getting ready for school. There are also some jokes I liked, e.g. the washtubs that fall on Karma's head when he's sneering about people. This fantasy version of Computer Girl Ritsu is amusing. This Demon Lord version of Koro-sensei has quite a good origin story in ep.11. I realised in ep.10 that I actively dislike anime versions of those otaku who reject 3D girls and instead obsess over 2D ones, probably because I think their real-life equivalents are gross and creepy too, but I have to admit that this element gets played in quite a clever way with Ritsu. The fantasy RPG setting is specifically a computer game one. Everyone in the class has a bug in their abilities. Ep.1 got me wondering if this might be the real Class E playing a computer game, but I soon lost sight of anything like that. It's... okay. It's not particularly good, but it's amusing. It has the original series's music and Jun Fukuyama playing Koro-sensei again, so that's worth a look at least. It's throwaway, but I'd say it manages to be better than Attack on Titan: Junior High. That's the kind of level we're talking about, though.